As an undergraduate student at UC Davis’ Bodega Marine Laboratory, I compared the change in pH of eelgrass beds and salt marsh communities at dusk and dawn to understand how photosynthesis and respiration altered the rate and range of pH change. Shukla, P. 2011. Effects of an eelgrass bed (Zostera marina) on seawater pH and alkalinity. Shukla, P. 2011. A comparative analysis between the pH and alkalinity of an eelgrass bed (Zostera marina) and a Salicornia dominant salt marsh. Shukla, P., Hill, T.M., Gaylord, B., Hosfelt, J., and Nickols, K.J. 2011. Understanding impacts of ocean acidification on seagrass and salt marsh ecosystems based on studies in Bodega Harbor, California. 92th Western Society of Naturalists Conference, Vancouver, WA. †Shukla, P. Hobbs, J., Kurth, R., Kindopp, J., and Cavallo, B. 2010. 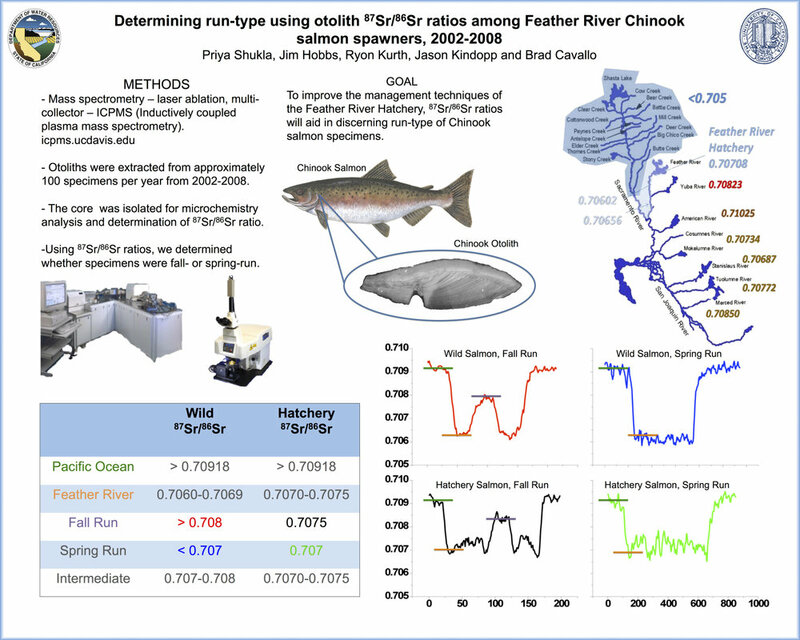 Determining run-type using otolith 87Sr/86Sr ratios among Feather River Chinook salmon spawners, 2002-2008. 6th Biennial Bay-Delta Science Conference, Sacramento, CA. As a member of Dr. Peter Moyle’s Fish Conservation Biology Group at UC Davis, I helped validate a technique to trace the life histories of Chinook salmon using stable isotope ratios in otoliths. Shukla, P., Hobbs, J., Kurth, R., Kindopp, J., and Cavallo, B. 2010. Determining run-type using otolith 87Sr/86Sr ratios among Feather River Chinook salmon spawners, 2002-2008. 6th Biennial Bay-Delta Science Conference, Sacramento, CA. Publication: Hobbs, J. A., Lewis, L. S., Ikemiyagi, N., Sommer, T., and Baxter, R. D. 2010. The use of otolith strontium isotopes (87Sr/86Sr) to identify nursery habitat for a threatened estuarine fish. Environmental Biology of Fishes. 89:557-569.